ROARING FORTIES™ Marine Saver Vest is a sleeveless/detachable zip-off sleeves vest made from premium oxford nylon fabric. Polar fleece material on the collar and deep front pockets are some of the features this vest has to offer. The Inflatable PFD/Lifejacket sits on the vest. 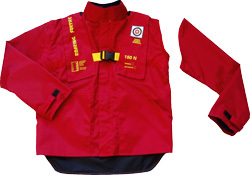 Our Marine Saver vest is both Australian Standard (AS4758) & ISO(12402-3) approved and exceeds the150N buoyancy. This vest is unique in that the bladder when inflated is visible on the outside of the vest. This makes the vest less encumbering than those vests with the bladders housed between the skins of the vest fabric. In addition, our vest is non constrictive to your chest ie will not hinder your breathing movement. This design will provide very stable flotation and will right an unconscious person in a safe floating postion ie face up at an inclined angle. Our vest is also modular. Any minor addendums can be easily achieved without impairing the performance of the vest. It is very economical to service & repair.